In this highly layered and symbolic composition, I have used primary colors to tie heaven and earth together. Gold and red are our traditional colors of holiness; they form the basic color scheme. I have added more modern colors as well. My work represents influences from many styles. All of my art is Gospel-based and inspired. I believe Jesus Christ is present in every culture, and I have chosen to celebrate his presence in our lives through Thai traditional cultural forms. I was moved to create art depicting Jesus’ life and message and as I created the influence of my cultural background naturally flowed through to produce a traditional Thai look. My belief is that Jesus did not choose just one people to hear his Word, but chose to make his home in every human heart. And just as his Word may be spoken in every language, so the visual message can be shared in the beauty of the many styles of artistry around the world. 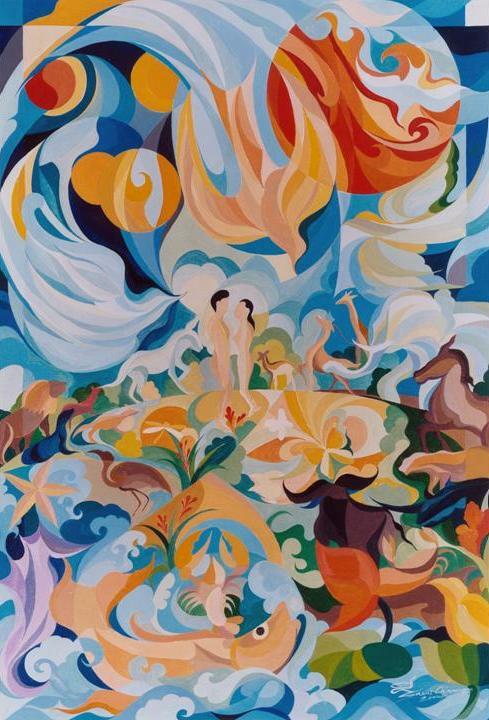 Sawai Chinnawong: Genesis 1, Paradise, 2003, 32" x 22", acrylic on canvas. Image and text appear in Christ on the Bangkok Road. The Art of Sawai Chinnawong, an 80 page color monograph of Sawai's drawings and paintings with an appreciative critical essay by Dr. William Yoder, published by OMSC, New Haven, USA. This book can be ordered at http://secure.omsc.org. The mission of the Overseas Ministries Study Center in New Haven, USA (www.omsc.org) is to strengthen the Christian world mission by providing residential programs for the renewal of missionaries and international church leaders, research, publications, and scholarly forums for the advancement of mission scholarship, and continuing education in cross-cultural Christian ministries. As a part of that mission, OMSC publishes Asian Christian art books, which may be found at and purchased from: http://secure.omsc.org.